Every day, homeless individuals, particularly those with mental or addiction issues, refuse shelter or are left unattended. Relief organizations search for these people to provide blankets, food, or transportation to a nearby shelter, but could use help tracking locations in need and coordinating among volunteers and staff. I developed technology that addresses this information problem, and in the last year I worked with an organization in Seattle to pilot test my solution. Seattle’s Union Gospel Mission (SUGM), the largest homeless relief organization in Seattle, has been rescuing homeless individuals for almost thirty years. Every day, they comb the streets of Seattle in their “Search and Rescue van” to locate individuals in need. They provide on-the-spot relief to as many individuals as they can find, and when they are unequipped to help, they mark the person’s location and provide relief at a later time. I developed an Android application that SUGM staff can use during their search and rescue missions to record and view locations of homeless individuals. When encountering an individual in need, staff can use the app to record the individual’s GPS coordinates and his or her needs. For example, they can specify that an adult and child require food and water, or that a man with mental or addiction issues is wounded and needs first aid. After the information is submitted, it is stored in a centralized server and is made available to all SUGM staff. I also developed a web application for the SUGM staff working in headquarters to view and manage the data recorded during search and rescue missions. The idea is for them to use the data to determine resources required by the search and rescue team and to dispatch relief and coordinate teams accordingly. Sharing data between all parties within the organization increases transparency and information-exchange, decreases wait-time, and reduces errors associated with manually writing and reading locations. Other benefits include improving the engagement of volunteers through the use of trendy mobile technology. In the future, we plan to crowdsource homeless searches by releasing our applications to the general public. 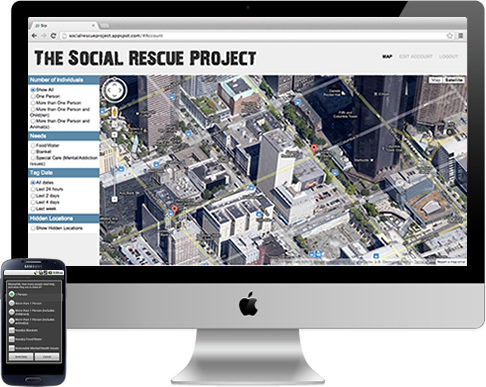 Any concerned citizen will be able to make a difference by submitting homeless locations, and organizations will benefit from receiving a broader and more complete set of data. We also plan to make our technology available to other search and rescue organizations across the country, and to hopefully start a nationwide movement of “10-second” volunteering, where in ten seconds or less a person can submit a location and potentially save a life. To learn more about this project, visit our website: http://socialrescueproject.com. If you are interested in working on this project and have experience developing web/mobile applications (especially iPhone apps), please contact me.